In this weeks parasha, in the plague of boils (sh'chin שחין) we come across a familiar word: אֲבַעְבֻּעֹת avabuot. This word only appears here (Shmot 9:9) but is familiar in modern Hebrew as the "pox" in "chicken pox" - אבעבעות רוח ababuot ruach (most likely based on the German Windpocken, which this site says the "wind" means "filled with air", "not really substantial".) Earlier generations would have associated ababuot with smallpox. Klein writes that אבעבועה - "blister, boil" is formed from בעבע with the prosthetic alef (as in אצבע) and the suffix heh. The root בעבע , he claims, is of imitative origin, like its English equivalent, bubble. It is related to the root בעה , which also means "to bubble" and בועה buah - bubble. 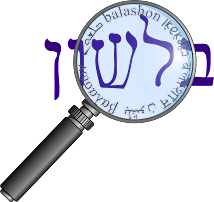 Several scholars identify בעה (bubble) and בעה (seek) by assuming that the original meaning of this base was 'to swell', whence developed the meanings 'to bubble' on the one hand, and 'to swell with desire' on the other. We are familiar with such derivatives of בעה as b'aya בעיה - problem, which developed from the Aramaic בעיא - question, and many Talmudic phrases like כדבעי - "as required, properly" and אי בעית אימא - "if you like I can say". To be fair, there are those, such as "The Mavens' Word of the Day", who claim that this sense of baggage is developed from the more popular sense of the word as "luggage".